Spécialisée dans la géochimie expérimentale à haute température. Intéressé à déterminer fractionnements géochimiques cours de genèse de magma, métamorphisme et métasomatose dans le manteau de la Terre. Mon objectif actuel est de comprendre les cycles géochimiques des éléments volatils magmatiques. Equilibre géochimique et processus cinétique des interactions liquide-minéral pendant la migration des fluides au niveau des zones de subduction: étude par une approche expérimentale hautes pressions -hautes temperatures. Fractionnement des isotopes légers sous conditions de hautes pressions et hautes températures en utilisant des mesures minéralogiques et empiriques. Processus cinétiques géochimiques généraux associés aux Sciences de la Terre (processus de diffusion dans les diamants, dans les minéraux; réactions cinétiques dans les systèmes silicatés). Observations géochimiques à l’échelle du micron et leurs relations aux cinétiques géochimiques. Voici, un lien blog pour une expedition de terrain au Japon (Sanbagawa, Aso, complexe de Nagasaki). Voir un AudioSlides de une publication dans GCA!! Dalou C., Boulon J., Koga K., Dalou R., Dennen R. (2018). DOUBLE FIT: Optimization procedure applied to lattice strain model. Computers and Geosciences DOI:10.1016/j.cageo.2018.04.013 . Hanley J.J., Koga K. (2018). Halogens in Terrestrial and Cosmic Geochemical Systems: Abundances, Geochemical Behaviors, and Analytical Methods. The Role of Halogens in Terrestrial and Extraterrestrial Geochemical Processes, D.E. Harlov and L. Aranovich (eds. ), Springer Geochemistry, DOI:10.1007/978-3-319-61667-4_2 . Koga K., Rose-Koga E. (2018). Fluorine in the Earth and the solar system, where does it come from and can it be found? - Le fluor dans la Terre et le systèeme solaire, d'où vient-il et où peut-on le trouver ?. Comptes Rendus de l'Académie des Sciences DOI:10.1016/j.crci.2018.02.002 . Narvaez D.F., Rose-Koga E., Samaniego P., Koga K., Hidalgo S. (2018). Constraining magma sources using primitive olivine-hosted melt inclusions from Puñalica and Sangay volcanoes (Ecuador). Contribution to Mineralogy & Petrology vol.173, p.80, DOI:10.1007/s00410-018-1508-8 . Reinhard A.A., Jackson M.G., Koornneef J.M., Rose-Koga E., Blusztajn J., Konter J.G., Koga K., Wallace P.J., Harvey J. (2018). Sr and Nd isotopic compositions of individual olivine-hosted melt inclusions from Hawai'i and Samoa: Implications for the origin of isotopic heterogeneity in melt inclusions from OIB lavas. Chemical Geology vol.495, p.36-49, DOI:10.1016/j.chemgeo.2018.07.034 . Wu J., Koga K. (2018). Direct analyses of fluorine in aqueous fluids extracted from 1-Gpa experiments. Chemical Geology vol.502, p.44-54, DOI:10.1016/j.chemgeo.2018.10.011 . Bénard A., Koga K., Shimizu N., Kendrick M.A., Ionov D., Nebel O., Arculus R.J. (2017). Chlorine and fluorine partition coefficients and abundances in sub-arc mantle xenoliths (Kamchatka, Russia): Implications for melt generation and volatile recycling processes in subduction zones. Geochimica et Cosmochimica Acta vol.199, p.324-350, DOI:10.1016/j.gca.2016.10.035 . Rose-Koga E., Koga K., Moreira M., Vlastélic I., Jackson M.G., Whitehouse M.J., Shimizu N., Habib N. (2017). Geochemical systematics of Pb isotopes, fluorine, and sulfur in melt inclusions from São Miguel, Azores. Chemical Geology vol.458, p.22-37, DOI:10.1016/j.chemgeo.2017.03.024 . Debret B., Koga K., Cattani F., Nicollet C., Van De Bleeken G., Schwartz S. (2016). Volatile (Li, B, F and Cl) mobility during amphibole breakdown in subduction zones. Lithos vol.244, p.165-181, DOI:10.1016/j.lithos.2015.12.004 . Koga K., Rose-Koga E. (2016). Fluorine, Earth Sciences Series. Encyclopedia of Geochemistry, W.M. White (ed.) 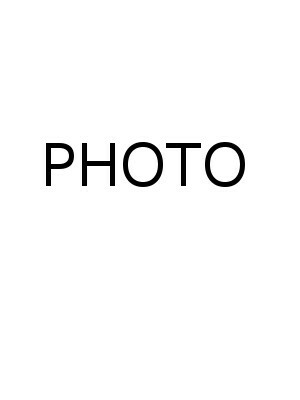 (ed. ), Springer International Publishing Switzerland, DOI:10.1007/978-3-319-39193-9_102-1 . Jackson M.G., Cabral R.A., Rose-Koga E., Koga K., Price A., Hauri E.H., Michael P. (2015). Ultra-depleted melts in olivine-hosted melt inclusions from the Ontong Java Plateau. Chemical Geology vol.414, p.124-137, DOI:10.1016/j.chemgeo.2015.08.014 . Jackson M.G., Koga K., Price A., Konter J.G., Koppers A.A.P., Finlayson V.A., Konrad K., Hauri E.H., Kylander-Clark A., Kelley K.A., Kendrick M.A. (2015). Deeply dredged submarine HIMU glasses from the Tuvalu Islands, Polynesia: Implications for volatile budgets of recycled oceanic crust. Geochemistry, Geophysics, Geosystems vol.16, p.3210-3234, DOI:10.1002/2015GC005966 . Van De Bleeken G., Koga K. (2015). 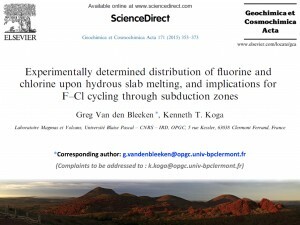 Experimentally determined distribution of fluorine and chlorine upon hydrous slab melting, and implications for F–Cl cycling through subduction zones. Geochimica et Cosmochimica Acta vol.171, p.353-373, DOI:10.1016/j.gca.2015.09.030 . Bennett N.R., Brenan J.M., Koga K. (2014). The solubility of platinum in silicate melt under reducing conditions: Results from experiments without metal inclusions. Geochimica et Cosmochimica Acta 133, 422-442. DOI:10.1016/j.gca.2014.02.046 . Cabral R.A., Jackson M.G., Koga K., Rose-Koga E., Hauri E.H., Whitehouse M.J., Price A.A., Day J.M.D., Shimizu N., Kelley K.A. (2014). Volatile cycling of H 2O, CO 2, F, and Cl in the HIMU mantle: A new window provided by melt inclusions from oceanic hot spot lavas at Mangaia, Cook Islands. Geochemistry, Geophysics, Geosystems vol.15, p.4445-4467, DOI:10.1002/2014GC005473 . Dalou C.L., Koga K., Le Voyer M., Shimizu N. (2014). Contrasting partition behavior of F and Cl during hydrous mantle melting: implications for Cl/F signature in arc magmas. Progress in Earth and Planetary Science vol.1, p.26, DOI:10.1186/s40645-014-0026-1 . Debret B., Koga K., Nicollet C., Andreani M., Schwartz S. (2014). F, Cl and S input via serpentinite in subduction zones: implications for the nature of the fluid released at depth. Terra Nova 26, 96-101. 106p.. DOI:10.1111/ter.12074 . Gaetani G.A., O’Leary J.A., Koga K., Hauri E.H., Rose-Koga E., Monteleone B.D. (2014). Hydration of mantle olivine under variable water and oxygen fugacity conditions. Contributions to Mineralogy and Petrology 167, 965-914. DOI:10.1007/s00410-014-0965-y . Koga K., Garrido C.J., Padrón-Navarta J.A. (2014). FTIR and Raman spectroscopy characterization of fluorine-bearing titanian clinohumite in antigorite serpentinite and chlorite harzburgite. Earth Planet Space 66, 60. .
Rose-Koga E., Koga K., Hamada M., Helouis T., Whitehouse M.J., Shimizu N. (2014). Volatile (F and Cl) concentrations in Iwate olivine-hosted melt inclusions indicating low-temperature subduction. Earth Planets Space 66, 81. DOI:10.1186/1880-5981-66-81 . Cabral R.A., Jackson M.G., Rose-Koga E., Koga K., Whitehouse M.J., Antonelli M.A., Farquhar J., Day J.M.D., Hauri E.H. (2013). Anomalous sulphur isotopes in plume lavas reveal deep mantle storage of Archaean crust: Nature, v. 496, p. 490-494. DOI:10.1038/nature12020 . Wu J., Koga K. (2013). Fluorine partitioning between hydrous minerals and aqueous fluid at 1 GPa and 770–947°C: A new constraint on slab flux: Geochimica et Cosmochimica Acta, v. 119, p. 77-92. DOI:10.1016/j.gca.2013.05.025 . Martin A.M., Laporte D., Koga K., Kawamoto T., Hammouda T. (2012). Experimental Sudy of the Stability of a Dolomite + Coesite Assemblage in Contact With Peridotite: Implications for Sediment-Mantle Interaction and Diamond Formation During Subduction. Journal of Petrology vol.53, p.391-417, DOI:10.1093/petrology/egr066 . Rose-Koga E., Koga K., Schiano P., Le Voyer M., Shimizu N., Whitehouse M.J., Clocchiatti R. (2012). Mantle source heterogeneity for South Tyrrhenian magmas revealed by Pb isotopes and halogen contents of olivine-hosted melt inclusions. Chemical Geology 334, 266-279. DOI:10.1016/j.chemgeo.2012.10.033 . Chollet M., Daniel I., Koga K., Morard G., van der Moortèle B.J. (2011). Kinetics and mechanism of antigorite dehydration: Implications for subduction zone seismicity: Journal of Geophysical Research, v. 116, p. B04203. DOI:10.1029/2010JB007739 . Hammouda T., Andrault D., Koga K., Katsura T., Martin A.M. (2011). Ordering in double carbonates and implications for processes at subduction zones: Contributions to Mineralogy and Petrology, v. 161, p. 439-450. DOI:10.1007/s00410-010-0541-z . Schiano P., Monzier M., Eissen J.P., Martin H., Koga K. (2010). Simple mixing as the major control of the evolution of volcanic suites in the Ecuadorian Andes. Contributions to Mineralogy and Petrology, 160, 297-312. DOI:10.1007/s00410-009-0478-2 . Koga K., Rose-Koga E., Métrich N., Di Muro A., Deloule E. (2018). Nepheline-Normative Primitive Melt Genesis in Arcs: Mineralogic and Lithospheric Controls. Goldschmidt conference, Boston. Koga K., Rouleau M., Brenan J.M. (2018). Grain boundary diffusion of Re, Os, Pt, and Pb, in olivine aggregate in presence of sulfide. EMPG 16. Narvaez D., Rose-Koga E., Samaniego P., Koga K. (2018). Study of primitive olivine-hosted melt inclusions from the Ecuadorian arc. 16th Internationl Conference on Experimental Mineralogy, Petrology and Geochemistry (EMPG XVI), Clermont-Ferrand, June 2018. 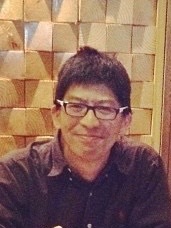 Koga K. (2017). Le fluor dans la Terre et le système solaire, d’où vient-il et où peut-on le trouver?. Colloque Français de Chimie du Fluor, Murol, France, 15-18 mai 2017. Koga K., Rose-Koga E., Nicollet C., Bruand E. (2017). Evolution of F and Cl Relative to Lithophile Trace Elements in Oceanic Crust, from Oceanic to Subduction Metamorphisms in Western Alps. Goldschmidt conference. Narvaez D., Rose-Koga E., Samaniego P., Koga K., Hidalgo S. (2017). Estudio de las Inclusiones Magmáticas contenidas en olivinos del Volcán Sangay y Puñalica para la determinación de la fuente mantélica y del agente metasomático. VIII Jornadas en Ciencias de la Tierra, Escuela Politécnica Nacional, Quito. pp. 427-432. Rose-Koga E., Koga K., Moreira M., Vlastélic I., Jackson M.G., Whitehouse M.J., Shimizu N. (2016). F, Cl, S Concentrations and Pb Isotopes in Melt Inclusions from São Miguel, Azores. Goldschmidt Conference, Yokohama, June 2016. Wu J., Koga K. (2016). Experimental Determination of DF(Hbl/Flu) in F-Bearing Systems at Lower Crust P−T Conditions. Goldschmidt Abstracts, 2016 3445. Wu J., Koga K. (2015). DF(Hbl/Flu) at Lower Crust P−T Conditions Determined by Direct Measurements on Extracted Fluids. Goldschmidt Abstracts 2015, 3457. Jackson M.G., Cabral R.A., Rose-Koga E., Koga K., Price A., Hauri E.H., Michael P. (2014). An ultra-depleted mantle component in the Ontong Java Plateau revealed by major, trace and volatile element abundances in olivine-hosted melt inclusions. Fall AGU, San Francisco 15th-19th december. .
Koga K., Cattani F., Nicollet C., Debret B., Van De Bleeken G. (2014). Assessment of tracer volatile element transfer in a mafic crust of a subduction zone from alpine ophiolites. Abstract 3.7.21 at Réunion des Sciences de la Terre, Pau, France, 27-31 Oct. 2014. .
Koga K., Rose-Koga E., Le Voyer M., Dalou C., Wu J., Debret B., Van den Bleeken G. (2014). Fluorine and Chlorine in mantle: are they useful volatile tracers? Abstract V51E-05 presented at 2014 Fall Meeting, AGU, San Francisco, Calif., 15-19 Dec. 2014. .
Rose-Koga E., Koga K., Hamada M., Helouis T., Whitehouse M.J., Shimizu N. (2014). Volatile (F and Cl) concentrations in Iwate olivine-hosted melt inclusions indicating low temperature subduction. Goldschmidt Sacramento, June 6-12th. .
Cabral R., Jackson M., Rose-Koga E., Koga K., Whithhouse M., Antonelli M., Farquhar J., Day J., Hauri E. (2013). Mass Independently Fractionated Sulfur Isotopes in HIMU Lavas Reveal Archean Crust in their Mantle Source. in Goldschmidt conference, Mineralogical Magazine. .
Debret B., Koga K., Nicollet C., Andreani M., Schwartz S. (2013). Comportement du F, Cl et S dans les serpentines en subduction: exemple dans les Alpes occidentales. Journées Petrologie-Endogène, Jan. 2013, CRPG, Nancy. in Journées Petrologie-Endogène, Jan. 2013, CRPG, Nancy. .
Gaetani G., Bucholz C., Rose-Koga E., Shimizu N., Koga K., Monteleone B. (2013). Reading the Melt Inclusion Record of Pre-Eruptive Magmatic Volatiles. in Goldschmidt conference, Mineralogical Magazine. .
Jackson M., Cabral R., Rose-Koga E., Koga K., Whitehouse M., Antonelli M., Farquhar J., Day J., Hauri E. (2013). Returning from the deep: Archean atmospheric fingerprints in modern hotspot lavas. in Abstract DI13A-08 presented at 2013 Fall Meeting, AGU, San Francisco, Calif., 9-13 Dec. 2013. .
Jackson M.G., Cabral R.A., Rose-Koga E., Koga K., Whitehouse M.J., Antonelli M.A., Farquhar J., Day J.M.D., Hauri E.H. (2013). Mass independently fractionated sulfur isotopes reveal recycling of Archean lithosphere in oceanic hotspot lavas. in EGU in Vienna (April). .
Jackson M.G., Cabral R.A., Rose-Koga E., Koga K., Whitehouse M.J., Antonelli M.A., Farquhar J., Day J.M.D., Hauri E.H. (2013). Mass independently fractionated sulfur isotopes reveal recycling of Archean lithosphere in oceanic hotspot lavas. in Gordon Research Conference at Mt. Holyoke (June). .
Koga K., Rose-Koga E., Le Voyer M., Dalou C., Wu J., Van den Bleeken G., Kovalcikova K. (2013). Do fluorine and chlorine follow water and carbon dioxide fluid in magma? in IAVCEI 2013 Scientific Assembly - July 20 - 24, Kagoshima, Japan, 1W_1A-O17, 20-24 July. .
Laporte D., Koga K., Médard E., Schiano P. (2013). Observer, quantifier, modéliser les processus magmatiques et leurs produits - Un colloque en l'honneur de Pierre Boivin et Ariel Provost à Clermont-Ferrand 23 et 24 mai. .
Rose-Koga E., Koga K., Schiano P., Le Voyer M., Shimizu N., Whitehouse M. (2013). Halogen contents and Pb isotopes of olivine-hosted melt inclusions: mantle source heterogeneity for South Tyrrhenian magmas revealed. in IAVCEI 2013 Scientific Assembly - July 20 - 24, Kagoshima, Japan, 1W_1A-P26. .
Van den Bleeken G., Koga K. (2013). F and Cl release by hydrous melting of subducted oceanic crust. in IAVCEI 2013 Scientific Assembly - July 20 - 24, Kagoshima, Japan, 1W_1A-P30. .
Wu J., Koga K. (2013). Fluorine partitioning between hydrous minerals and aqueous fluid at 1 GPa and 770-947°C: A new constraint on slab flux. in IAVCEI 2013 Scientific Assembly - July 20 - 24, Kagoshima, Japan, 1W_1A-P27. .
Cabral R.A., Jackson M.G., Rose-Koga E., Day J.M.D., Koga K., Shimizu N., Whitehouse M., Price A. (2012). Oceanic gabbro signature in Mangaia melt inclusions. Annual V. M. Goldschmidt Conference, Mineralogical Magazine, 75, 1535, 2012. .
Dalou C., Koga K. (2012). Fluorine and chlorine incorporation mechanisms in nomenally halogen-free mantle minerals, In Petrology and Geochemistry. EMPG XIV - International Conference. March 4-7, 2012, Kiel, Germany. .
Debret B., Koga K., Nicollet C., Andreani M., Schwartz S. (2012). Quantitative assessment of subduction input of F, Cl, and S via serpentinites: Preliminary report. Eos Trans. AGU, 93, Fall Meet. Suppl., Abstract 1488067. .
Gaetani G.A., O'Leary J.A., Koga K., Hauri E.H., Rose-Koga E. (2012). Hydration of mantle olivine under variable water and oxygen fugacity conditions: a combined SIMS and FTIR study. Eos Trans. AGU, 93, Fall Meet. Suppl., Abstract 1497525. .
Van den Bleeken G., Koga K. (2012). F-Cl release by melting of subducting oceanic crust, Experimental Mineralogy, In Petrology and Geochemistry. EMPG XIV - International Conference. March 4-7, 2012, Kiel, Germany. .
Wu J., Koga K. (2012). Fluorine partitioning between hydrous minerals and aqueous fluid at 1 GPa and 770-947 ˚C, In Petrology and Geochemistry. EMPG XIV - International Conference. March 4-7, 2012, Kiel, Germany. .
Laporte D., Hardiagon M., Provost A., Koga K. (2011). Quantifying the behaviour of carbon dioxide during basalt ascent and degassing: Deep Carbon Observatory Workshop, IPG Paris, 15-16 juin 2011. .
Rose-Koga E., Koga K., Hamada M., Helouis T., Whitehouse M.J., Shimizu N. (2011). Volatile abundances and Pb isotopes in melt inclusions from Iwate volcano, Japan: Prague (Czech Republic), 14-19 August 2011. .
Dalou C., Koga K., Shimizu N. (2010). Experimental determination of F and Cl partitioning between lherzolite minerals and basaltic melt: an investigation of anion incorporation in minerals and melts. in Experimental Mineralogy Petrology Geochemistry XIII, Toulouse. .